In October, second-grade teacher Viviane Vizzioli, 49, was received in her classroom with a large heart drawn in the blackboard. Her students, all around seven years old, also brought brigadeiros (chocolate truffles) and wrote a message: "We are sorry teacher Viviane for yesterday." The children, who go to Pedro Aleixo public school, in the eastern outskirts of São Paulo, disobeyed their teacher when she asked them to finish their drawings. "After so many disruptions, they felt bad for having disappointed me," Vizzioli said. She was the third teacher to teach them during the school year since their original instructor took maternity leave. Because the law mandates that a teacher can only be effectively replaced after the original start their leave, the children had a substitute teacher for a while, until Vizzioli was formally hired. She was concerned. The class, considered an engaged and well-behaved group, was behind schedule because the teacher changes. Her students are children of cooks, taxi drivers, security guards, and other teachers. Four of the 30 children in this second-grade class had barely learned syllables when the expected milestone would be them being close to being alphabetized and reading comics or newspaper headlines. In November, Vizzioli suffered a stroke, less than two months after taking over the class. She was taken to the hospital but passed away a few days later. A fourth teacher will end the school year with the second-graders. The guiding national document for São Paulo's new school curriculum is called Base Nacional Comum Curricular (National Baseline Curriculum) was discussed and approved during the Rousseff and Temer administrations. These new curriculum guidelines come with high hopes. They are considered one of the most critical measures to improve Brazilian education -- currently, 70% of the country's students graduate from middle school at 17 without the expected knowledge of the Portuguese language at that age. The new curriculum should also improve teacher training in the long run, since colleges can build their classes around the guidelines. Textbooks now have more explicit instructions on content. But one of the main goals is to make it crystal clear what each one if the 48 million Brazilian schoolchildren should know at the end of each grade. For example, the guidelines establish that children should be alphabetized entirely at the end of second grade when they should be seven or eight years old. Until now, the acceptable limit was one year later, at third grade. During 2018, Folha heard many praises to the new city curriculum. It follows contemporary education theories by proposing that students build their knowledge instead of passively waiting for the instructor to dictate content. The textbooks were also well regarded. On the other hand, there are concerns about how the guidelines will be implemented, like the lack of teacher training and delays in textbook deliveries. 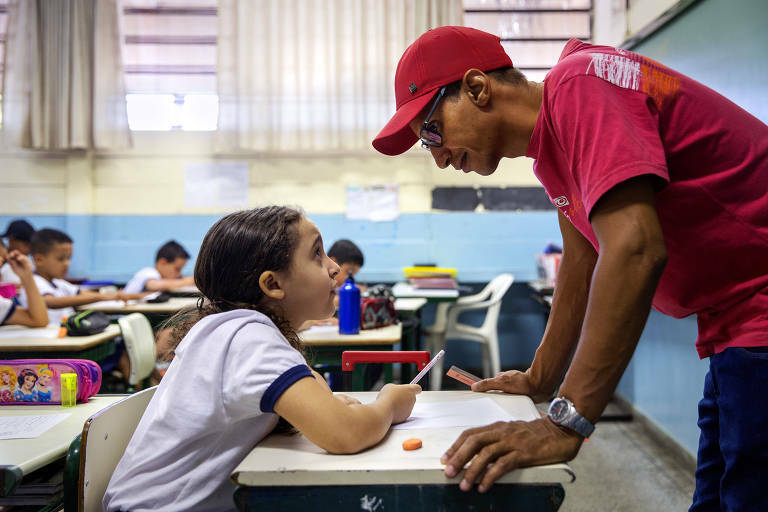 There are also other structural issues that could threaten the new curriculum, like the high turnout of teachers and principals in São Paulo's municipal schools. São Paulo's school system has a population of students larger than whole cities, like Natal, capital of Rio Grande do Norte, or Boston, in the United States: one million children between first and eighth grades, and 60,000 employees. In such a large school network, it's a challenge to improve the quality of education consistently, even with São Paulo being the first economy in Brazil. Around 60% of fifth-grade students (approximately 11 years old) score below the expected in math. For example, they can't tell how many total minutes are contained in one hour and twenty minutes. São Paulo's education secretary Alexandre Schneider saw in the new guidelines an opportunity to kickstart a change towards improvement. In May 2017, he sent a WhatsApp message to professional contacts saying that São Paulo's school system was going to adopt the new national guidelines, which at that time weren't ready yet. "I can't afford to lose any time," said Schneider during an interview in January. "If we waited any more, the new curriculum would only start in the administration's third year, and there is an election the following year," he explained. Despite the short deadline, the education department heard 44,000 students and 16,000 teachers to create São Paulo's curriculum based on the national guidelines. It was named City Curriculum, and city officers wrote its final version, with the help of consultants. Schneider also said the department took care not to interrupt the ongoing curriculum, so the new municipal document is more about adjustments and alignments with the national guidelines. It also incorporated United Nations guidelines to teach sustainable development. Other Brazilian cities, like Teresina, are using the São Paulo curriculum as an inspiration on how to adapt the national guidelines to their realities.